Our range of products include keyboard pump - vmeca, turtle pump - vmeca, mini pump - vmeca and micro pump - vmeca. VMECA Midi Keyboard Pump is stackable vacuum generator. Each pump creates vacuum as an individual pump. 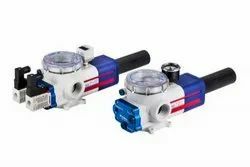 The advantages of this unit is that it can be operated using just two control valve while retaining individual vacuum lines separate to one another, therefore if any leakage or surface deformation occurs and one pad loses it vacuum, it does not effect the vacuum level in the other pads. Pumps can be stacked up from 8 units depending upon requirements. The VMECA Turtle Pump is integrated with a Vacuum Filter and is designed to attach all the necessary components to build a vacuum system. 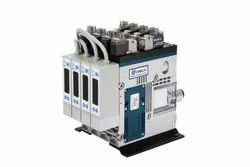 In particular, the built-in VMECA cartridge provides a more stable vacuum than conventional vacuum pumps, and an efficient vacuum system is possible. VMECA Mini Pumps are lightweight and compact but features extreme strength while conserving energy and air. 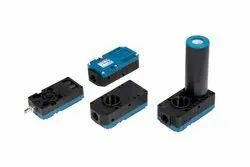 The Mini Pumps’ condensed size enables it to be placed in dense and tight environment but still be able to provide the optimal power the machines need. 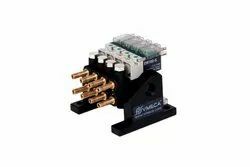 The MC100 series is a micro vacuum pump with a built-in VMECA Micro-Cartridge that provides stable vacuum levels and flow. This pump is designed for stackable and individual vacuum generators. Especially, all the components needed for a vacuum system are integrated so there is no need for any additional vacuum components.